Surprise, surprise: Porsche really does want to take manual 911 fans’ money after all. We finally got a manual 911 GT3 because Porsche saw stick-shift 911 Rs selling for insane prices, reports Road & Track. Fans demanded when Porsche wasn’t supplying, and Porsche didn’t like being left out of that insane cash-a-palooza. The 911 R was an ultra-limited-run version of a 911 GT3 RS without the flashy bodywork and more importantly, with a stick shift. It was in such high demand that Porsche fans—many of whom felt snubbed when there was no manual 991-generation 911 to begin with—snapped the 911 R up for far above its $185,000 list price. 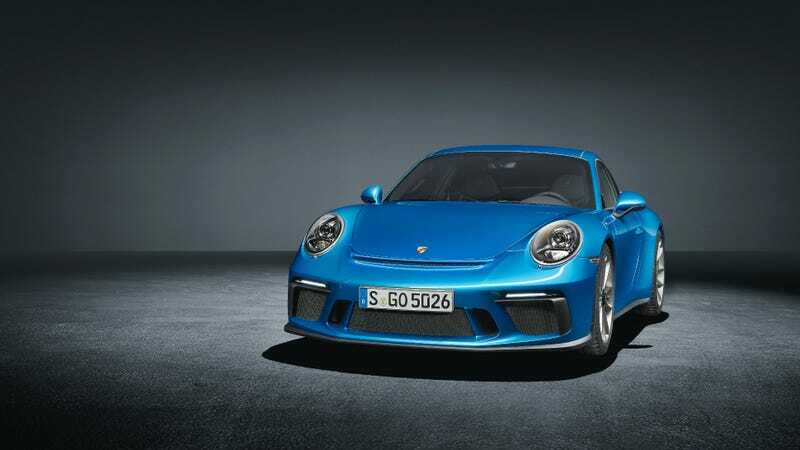 Porsche took notice of this, and finally pulled the “la la la, we’re not listening to these manual zealots because dual-clutch transmissions are the future” fingers out of their ears, and came out with the non-limited-run GT3 Touring Package with that coveted stick shift. We did not expect this, let me say, crazy reaction concerning used car prices. Because some people are making only money with the car. We don’t like that. If [the GT3 Touring Package] helps keep the prices a little bit lower for the average customer of our cars, it’s better. Of course, there are some specific customers who are a little bit disappointed, but it’s okay, we can live with this. This new GT3 Touring Package no doubt annoyed some 911 R owners who no longer felt like they had as exclusive a car, save for a few extra lightweight and visual tweaks that set it apart. But the demand was there, and Porsche would rather keep that profit than let some rich jamoke make it on resale. Achleitner said that fans he spoke with at big events like Rennsport Reunion yearned for a simpler 911, and those conversations eventually led to the new 911 Carrera T and the 911 GT3 Touring Package. As for Porsche, they really did the whole “insane 911 R resale prices” thing to themselves. They didn’t listen to their customers who wanted a manual transmission GT3 (and still won’t listen to them on the GT3 RS). They didn’t even listen to themselves, as they had a manual GT3 test car that they enjoyed greatly when they were developing the 991 GT3. So, when Porsche finally gave the people what they wanted—a high-performance 911 with a stick—no duh it sold over list price. No sympathy here. None at all. Just take your pile of ultra-fast stick-shift 911 cash and you lie in that bed of money you’ve made, Porsche.